Pour water into a large bowl or measuring cup, sprinkle yeast into the water and allow to dissolve, stir to mix completely. Add brown rice syrup and stir, set aside for 10 -15 minutes and allow yeast to proof. Place flour and salt into bowl of food processor, with machine running, pour water through the feed tube. Process until dough forms a ball and slightly sticky, If dough is too wet, add a tablespoon or two of flour. If too dry, add water one tablespoon of water at a time. Turn dough onto a lightly floured surface and knead for a minute or two by hand. Dough should be smooth, tough and very elastic. Brush some oil in a large bowl, place dough into bowl, cover loosely with a damp towel. Allow dough to rise for about 2 hours, at room temperature, or until dough has doubled in bulk. Deflate dough and allow to rest on a lightly floured surface, covered for 10 minutes. Cut dough into 8 or 12 pieces, depending on how large or small you like your bagels. Press your finger through the center of each ball to make a hole. Rotate bagel around your finger in a circular motion, making a hole about 2 inches. Place shaped bagels back on lightly floured surface and cover with damp towel, allow to rise 30 minutes. Bring a large pot of water to a boil and preheat the oven to 400. Pour the everything toppings into a shallow bowl and set aside. Lightly grease a baking sheet and set aside for later. Drop the bagels one at a time into the boiling water, making sure not to crowd, I boiled 3 at a time. Boil 1 minute at a time on each side, remove from water with a slotted spoon, drain briefly, dip top of bagels into topping, place on a lightly greased rack to drain. 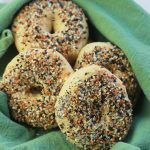 Place bagels on prepared baking sheet, bake 20 to 25 minutes, or until bagels are browned.